The Domplatz ("Cathedral Square") right in front of the Salzburger Dom Cathedral is surrounded by the Residenz Castle and St. Peter′s Abbey. Look for the mantelpiece over the main window (look right if you face the Dom): it is a face making a grimace towards the Residenz, the Prince Archbishop′s castle. It was made to show to the people that the mighty Abbot of St. Peter′s could risk to mess with the Prince Archbishop. Passing the arches of the cathedral ("Dombögen") by Giovanni Antonio Darios, you get to the Residenzplatz Square to the North or the Kapitelplatz to the South of the Salzburger Dom. Under the northern arches you can see the statue "The cardinal" by Giacomo Manzu. The Madonna statue in the centre of the Domplatz was made by Johann Baptist Hagenauer between 1766 and 1771. The side-figures depict angels and the devil, as well as allegories of truth and the church. The Domplatz is the site where the "Jedermann" is staged during the Salzburg Festival, implementing the façade of the cathedral to use the dramatic scenery. In late November and December, it is the location of the Christmas Market and draws thousands of visitors. The site where the current cathedral or Dom of Salzburg stands was probably a sacred place for rituals and sacrifices from Celtic and Roman times. It is known that the first Dom was built under the guidance of St. Virgil, who might have used foundations by St. Rupert. The first Salzburg Dom was recorded in 774. In this year, the relics of St. Rupert were transferred to the Dom from St. Peter′s Abbey. The so-called Virgil Dom of Salzburg was built between 767 and 774 and was 66 metres long and 33 metres wide - which, back then, made it one of the largest sacral buildings in Europe. Archbishop Arno (785 - 821) was the first to arrange changes and renovations of the Dom, which was in place for less than 70 years: in 842 it burned down after being struck by a lightning. Three years later, the re-erection of the cathedral started. Under the reign of Archbishop Hartwig, a long choir with a crypt and an extension of the rebuilt cathedral was built towards West between 1000 and 1020. Under Archbishop Konrad I., two West - towers were built between 1106 and 1147. However, in 1167 the Virgil Dom of Salzburg was on fire again - but this time, it got even more seriously damaged. Under the reign of Archbishop Konrad III., the Salzburger Dom was re-built. The resulting Dom was the biggest church that was ever built in Salzburg: 122 metres long, 48 metres wide and a total size of 5,200 square metres in five naves made the Salzburger Dom the biggest cathedral in the whole of the Holy Roman Empire. Around the year 1200, the new Salzburger Dom was officially opened with a ceremony. Over the centuries, the Dom was on fire several times - in fact, it was the 8th fire on the Dom, that brought the final end to Virgil′s foundations in 1598. The Romanesque basis was so seriously damaged and the roof had collapsed, that Prince Archbishop Wolf Dietrich von Raitenau ordered the complete demolition of the old cathedral. The work took seven years and left nothing from the old Dom than parts of the crypt; however, today you can still visit the foundations in the Domgrabungsmuseum during its limited opening hours. To re-build the Salzburger Dom more elaborately than ever before, Wolf Dietrich hired the Italian builder Vincenzo Scamozzi. The original plans of Scamozzi were proposing a Dom that would fit for 16,000 people - all of Salzburg′s population back then. Even a pompous maniac like Wolf Dietrich von Raitenau had to say no to these ideas and so the work for a smaller cathedral started in 1611. The conflict with Bavaria in 1612 caused Wolf Dietrich to disappear in a "dungeon" (a luxury apartment in the fortress) and the construction work being interrupted. Wolf Dietrich′s successor and nemesis Prince Archbishop Markus Sittikus hired Santino Solari in 1614 to finish the building. At Sittikus′ death, the Salzburger Dom was almost complete and finished under Prince Archbishop Paris Lodron, who opened the cathedral in 1628. The towers were finished in 1652 and 1655. Since then, the Salzburger Dom was severely damaged on two occasions: during renovation works the Dom caught fire in 1859 and during World War II, a US-American bomb hit the building so severely, that the dome collapsed. 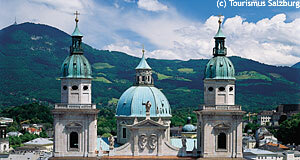 From 1945 to 1959, the Salzburger Dom was re-built in its original shape and re-opened by Archbishop Andreas Rohracher. The front façade of the cathedral is divided into three horizontal units and covered in so-called "Untersbergmarmor" (Untersberg mountain marble), though it is no marble in the geological sense. In front of the main gates you will see four big statues; their bases bear the coat of arms of the Prince Archbishop Guidobald von Thun and Prince Archbishop Johann Ernst von Thun. The two lateral figures from 1660 were made by Bartolomäus van Opstal and depict St. Rupert holding a salt barrel and St. Virgil with a church. The two central statues were made in 1697 and 1698 by Bernhard Michael Mandl and depict St. Peter with keys and St. Paul holding a sword. Behind the four statues you find the main entrance to the Salzburger Dom. The three gates were made of bronze in 1957 and 1958 and represent the three divine virtues ("Göttliche Tugenden"). The gate of faith ("Tor des Glaubens") on the left hand side was made by Toni Schneider-Manzell, the central gate of love ("Tor der Liebe") by Giacomo Manzu and the gate of hope ("Tor der Hoffnung") on the right hand side was made by Ewald Matare. On the central level of the façade you find the four evangelists. As mantelpieces over the two windows you find a lion and an ibex, the animals in the coat of arms of Prince Archbishop Paris Lodron and Prince Archbishop Markus Sittikus. On top of the windows you find a golden crown that matches with the Madonna statue on the Domplatz Square, if watched from between the arches of the Wallistrakt. On top of the front façade you find a statues of Moses holding the Ten Commandments and Elias flanking a "Christus Salvator" in the centre. These three statues were made by Tommaso di Garona in 1660. He is the mason who built the Residenz Fountain. The side towers are divided into three units, too. They bear clocks and the bells of the Salzburger Dom. They were presented to Salzburg in a ceremony held by Prince Archbishop Paris Lodron in 1628. During the war, all except two were removed until 1961. Ever since then, there are seven bells in the Dom. The biggest is the "Salvatorglocke" (salvation bell) of 14,256 kilograms. It is the second-biggest bell of Austria. The palate of the main nave of the Salzburger Dom bears paintings by Donato Mascagni and Ignazio Solari, showing scenes from the life (10 smaller ones) and passion (15 large ones) of Christ. The stucco works were made by Guiseppe Bassarino around 1628. It is white and crested by black stucco. Along the main nave, you find four chapels on each side that are connected among each other. In every one of these chapels you can see a side altar and palatine frescos. The highlight of the cathedral is with no doubt its dome, which is 71 metres high. Look for the two rows of eight frescos each, displaying scenes from the Old Testament. They were painted by the same artists as the ones that decorated the main nave, Donato Mascagni and Ignazio Solari. The paintings relate to the life and passion scenes from the nave. On top of these paintings you can see the images of the four evangelists and beyond that the coats of arms of Prince Archbishop Paris Lodron and Archbishop Andreas Roracher - the Bishops who opened the cathedral or re-opened it after World War II respectively. In the left side nave follows a motive of St. Francis, the right one a motive of the Virgin Mary. Look for the familiar coat of arms of Paris Lodron, as well as sacral art. To the left and the right of the Francis altar you find the epitaphs of several Prince Archbishops: Leopold A. Firmian (died in 1744), Guidobald von Thun (died in 1668), Max Gandolf von Kuenburg (died in 1687) and Jakob E. von Liechtenstein (died in 1747). Around the Mary altar you find the epitaphs of another set of Prince Archbishops: Andreas J. Dietrichstein (died in 1753), Johann E. Thun (died in 1709), Franz A. Harrach (died in 1727) and Siegismund Schrattenbach (died in 1772). The main altar in the front was probably built by Santio Solari in 1628. The painting depicts the resurrection of Christ and was made by Donato Mascagni. Above the painting you see statues of St. Rupert and St. Virgil as well as allegories of Religio and Caritas. Between the figures an inscriptions reads: "Notas mihi fecisi vias vitae" (you showed me the way of life). On top of the altar there are statues of angles holding golden crucifixes. Eventually, there are epitaphs of two more Prince Archbishops just to the right and left hand side of the main altar: Markus Sittikus (died in 1619) and Paris Lodron (died in 1653). The organ that is in use for services today was built in 1988, but the old organ of the Salzburger Dom is still essentially the same as the one built by the famous organ builder Josef Christoph Egedacher in 1703. From June to September you can visit an organ recital every Wednesday and Saturday at 11.15. The recital lasts for about one hour. On the right hand side of the main altar you find the entrance to the crypt. It is based on the foundations of the Romanesque Virgil Cathedral, of which you can find remains in the crypt. In the round tower you can see a mosaic, showing the scale of the former Salzburger Dom in comparison to today′s cathedral. The crypt is the tomb of the Archbishops of Salzburg. The "Zehneckraum" (ten corner room) contains the tombs of the Prince Archbishops from the 17th to the 18th century.